Crotched Mountain’s old hospital building in Greenfield is slated for renovations as part of a project that will be funded by a $21 million federal loan. 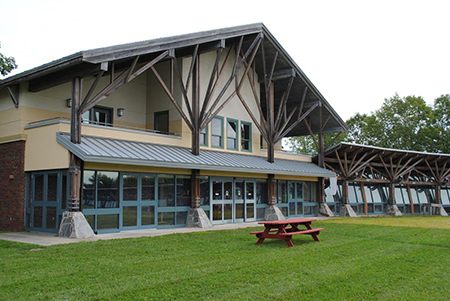 The parent organization of the Crotched Mountain School in Greenfield, NH, has won a $21 million federal loan to pay for facility improvements at the facility. The Keene Sentinel reported that Crotched Mountain Residential Services Inc. applied for funding from the U.S. Department of Agriculture, with the goal of increasing its student population by 20 percent and enhancing its focus on educating and supporting children and young adults with autism. The organization serves children and adults with disabilities and other special needs. Plans include improving the old hospital building and school building, which were constructed in the 1960s, and adding classrooms and more space for activities, David Johnson, Crotched Mountain’s vice president of marketing and communications, told the Sentinel. “We’ve been around for over 65 years, so this will be an opportunity to invest in the buildings we have and continue to expand and increase our scope of services,” he said. The USDA announced the loan to Crotched Mountain as part of a $501 million investment in 60 projects designed to improve rural health care infrastructure nationwide. Crotched Mountain operates a residential and day school for about 90 children and young adults ages 6 to 21 with special needs, many of whom have autism. The organization also serves as a temporary residence for children who are removed from their homes by the NH Division for Children, Youth and Families. Johnson said there are some steps that need to be taken before the organization receives the funds.